Design trends for your kitchen in 2018 are coming in hot! 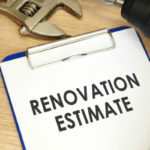 If you are planning a kitchen remodel in the coming year, you’ll want to include one or maybe all of these trends in your overall plan. Get ready, here come the top 5 kitchen trends for 2018. Up until now, glass doors were often a part of your grandparents’ or great-grandparents’ china cabinets or buffets, but no more. A collection was likely inside of inherited fine china or porcelain dolls. Little did they know they were on trend for 2018. See-though doors, while offering the convenience of seeing what is inside, are also a design element, making the space look more open, without all the dust of open shelving. Upper cabinets with glass doors are on trend for 2018, though in today’s homes it is unlikely you’ll see any find china peeking back at you. Never fear, your everyday dishes will do just fine, stacked nicely and protected from dust, crumbs, and more. The see-through trend has even made its way to refrigerator doors as well, providing a sense of openness and light. While delivering an extra display area for fruits, veggies, and beverages, the see-through refrigerator doors allow you to build your grocery list without ever having to open the doors. 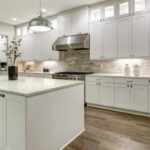 White painted cabinets have been the king and queen of the kitchen for nearly a decade, and while that trend isn’t likely to disappear, the new color choices are darker and bolder. For instance, gray may be the new white, possessing the characteristics that make everyone love white. Gray, depending on its hue can brighten a kitchen, while remaining a neutral palette for accents in cool blues and greens or warm yellows and oranges. Deep blue, navy, and plum are lined up to become newest kitchen color classics. Each in its own way works well with a multitude of décor options, metal accoutrements, and color accents. Gaining popularity just as quickly are two tone cabinets, another nod to grandparents’ can-do make-do attitude of old. Especially popular are oak wood tones and white, as well as navy or plum paired with gray. While granite will never go out of fashion, timeless as it is, quartz and marble are gaining popularity. 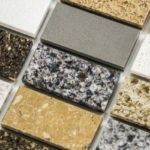 Of course, granite’s single flaw is that without sealing, it can absorb spills and permanently stain. Quartz, on the other hand, is non-porous and has no need of sealing to keep it in tact. Quartz, until now, hasn’t had nearly the style of granite or marble, but that has all changed with modern techniques lending notes of design and flair. Marble is also returning with flowing patterns in bold tones that simply cannot be matched by man-made techniques. Integration of appliances into cabinetry is not new – but it is certainly reaching new heights in kitchen design in 2018. Minimalism, in the form of “appliance garages” as they are known, now send the everyday conveniences – toasters, mixers, blenders, coffee makers, cutting boards, and microwaves – into these convenient counter top specialty cabinets and beautifully out of sight. 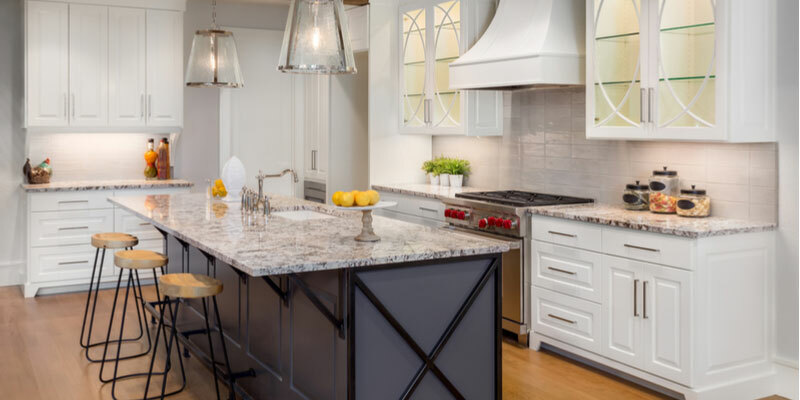 From concrete countertops to brick backsplashes, industrialism, ala warehouses, factories, and commercial restaurants has come of age in the kitchen. Open floor plans, high ceilings, reclaimed wood, cast iron, and repurposed carts are all gaining new life in today’s industrial design trends. 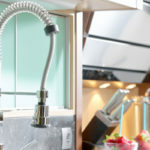 Joining farm sinks, pot fillers, exposed beams, industrial lights and other elements of commercial kitchens; all are finding their way into your home.